PriceProPharmacy.com is an online pharmacy that claims to be your Go-To Canadian pharmacy which you can find affordable prescription drugs here that are available to Americans. So, although this is a Canadian Pharmacy they are offering low priced drugs for Americans. According to the information I managed to find on their website, they are offering 100% money back guarantee, they are having a flat shipping fee of 9.95 USD, they claim to be all trusted by Americans and they are having the lowest price guarantee with up to 80% of discounts! Which surely sounds great. The pharmacy is claiming that customers can shop and save money on top prescription drugs, but they claim to have all the needed medications as you can find in your local pharmacy but at much better prices. They claim to deliver directly to your door. They claim that PricePro Pharmacy’s ultimate goal it is to provide affordable prescription medication to everyone. They claim to offer safe and secure online shopping and they are committed to meeting and even exceeding all the standards that are outlined by the leading pharmacy accreditation organizations. They claim that customers can easily, safely and 24/7 purchase medications from their website. The information on the site suggests that this company is proud of a few factors such as: licensed pharmacy and also servicing their local community, they are offering safety standards, privacy and security and they are also spreading the Savings with their referral program. The information on the site suggests they have shared an exact address located in Surrey, BC, Canada and the pharmacy is also an active social media user on Facebook, Twitter and LinkedIn. All in all, these surely sounds great but without checking it all, they are only promises and I will check if they keep it as the pharmacy suggests the site is legitimate, all secure and we would try to prove it or otherwise. The assortment of medications seems to be really wide. Customers can find their needed medications using different methods. For example, they can find the top 50 best selling medications, they can also find the medications by name of the first letter of the drug or there’s also the possibility to find the medications using the search function or lastly, by the category of medications. In order to determine the selection of medication I would need to check the categories of medications and by checking it all, there seem to be 171 different drug categories which are arranged in alphabetical way to make it easier to find them. checking for the categories of medications by the health condition, people are able to find a lot of different medications including: acne, addiction treatment, heart attack, birth control, erectile dysfunction, COPD, gout, hair loss, tuberculosis, different types of cancer and many, many other categories of drugs. They seem to sell a lot of different medications as there seem to be a lot of different health categories of medications, however, there is information that customers wouldn’t be able to find any controlled medications such as narcotics or anything in this matter. I checked their ED medications and it seems the pharmacy is offering quite a good number of different ED drugs. There is no information suggesting how many drugs are found in their drugstore, but assuming there are at least 5 different drug (or maybe even more) in each category, there are already a lot of different drugs. People can find their needed drugs really fast and without a problem and there seem to be a lot of different medications and for this reason, I think that PriceProPharmayc.com well deserves a rating of 5 stars since customers are having high chances to find whatever medications they are searching for at this pharmacy. According to the information on their website, the pharmacy is offering both generic and branded medications. 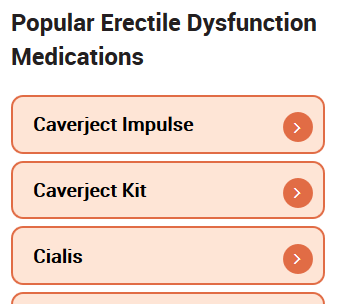 In order to check the prices, I will check the most famous ED drugs such as Cialis, Viagra and Levitra. I will talk about the normal doses of these medications and the normal quantities of drugs which is usually around 90 pills. The first drug to talk about is Cialis 20 mg which, as I said, comes in both generic and brand form. The maximum pills the pharmacy is selling is 88 pills and as much as we can see in the screen below, the lowest possible price per pill is 14.50 USD per dose of brand Cialis 20 mg and 0.81 USD per dose of generic Cialis 20 mg. The next medication that I am going to talk about is Viagra which its usual dose of 50 mg and its lowest price per pill for brand Viagra is 10.13 USD and 1.25 USD lowest price per pill for generic Viagra 50 mg.
Last drug to talk about is Levitra which has different maximum quantities of pills that you can purchase here. For example 48 tablets for brand or 90 tablets for generic form. The lowest possible prices come as follow: 8.88 USD per dose for brand Levitra 20 mg and 0.98 USD per dose of generic Levitra 20 mg. Remember that these are the lowest possible prices if you purchase the normal dose and maximum quantities. The prices per pill can be higher if you get less pills or it can be lower if you get maximum quantity but lower dosage of the pills. All in all, the prices are pretty good. For example they are very good for generic Levitra and Cialis but a little bit higher for generic Viagra compared to other online pharmacies. The prices for brands are moderate as you can indeed save money, but other pharmacies have better prices. For all these reasons, the pharmacy is receiving a rating of 4 stars for price policy as prices are good, but I’ve seen better. The information on their website is suggesting that PriceProPharmacy.com is offering delivery to 2 main countries and they are Canada and the United States of American, however this does not mean they do not offer shipping in other countries as they do mention the fact that they may arrange delivery in other countries world wide. Regretfully, there are not very much details about this, however customers may call the customer support service and they will provide details about the international shipping. They have not shared what’s the price or delivery timeframe for international shipping, however they did offered shipping fees for delivery in Canada or USA – 9.95 USD. This fee doesn’t matter what’s the number of medications offered. Special conditions for shipping is having a fee of 25 USD. Ask for the shipping fee in your own country. The pharmacy offers next day delivery only in Canada and it has a shipping fee of 25 USD. According to the information on the site, the shipping made in Canada should receive the medications within five business days while US patients are getting their needed drugs in anywhere between 8 to 18 business days. All the shipping information that I managed to find on their website, to my opinion, deserves a rate of 3 stars. According to the information that I have managed to find on their website, the company is accepting Visa, Master Card, American Express, Discover, personal check (electronic check), as well as money order. To my opinion, that’s really good that the company is offering so many different payment methods which allow customers to choose through which method to pay for their medications. 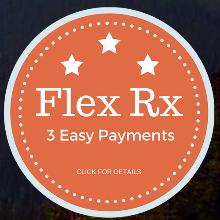 The pharmacy is also having a Flex Rx Program which includes 3 easy payments. To my opinion, all of this is really good. Customers have a variety of payment methods to choose from which is a big plus for the pharmacy. PricePro Pharmacy seem to make everything possible to provide an amazing service to customers offering many different payment methods. For this reason, my rate is going to be 5 stars here. According to the Page Speed Insights test offered by google developers, this online pharmacy’s site is having fairly good page speed loading but it could have been better. The loading of the pages speed is an extremely important factor for technical characteristics as people do not like waiting for the pages to load. The mobile version of the website is yellow marked and scored with 52 meaning the page speed is average. The desktop version is much better. It has a fast page speed load scored with 91 out of 100 and is green marked. All of this indicates that there shouldn’t appear page speed issues with desktop version but there might be some with mobile version. In the end, the overall rate this pharmacy’s site page speed test deserve is 4 stars. By doing the mobile friendly test that is also offered by google developers I got really disappointed. The page is not mobile friendly and this means the page can be difficult to use on a mobile device and sometimes, not allowing the mobile users fully arrange their orders online. Except for the fact that there are page loading issues, google test discovered that clickable elements are too close together and plus to that, content it is wider than the screen. All of this is really bad. Since the pharmacy is not having a mobile version for their site, mobile users can’t browse the site, and that can be very inconvenient for a lot of potential customers. This unit is getting a rate of 1 star only. Yes, it does seem so. 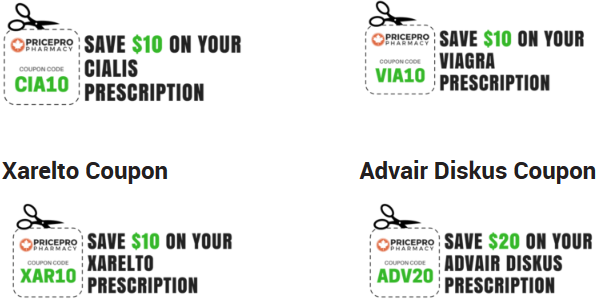 Every single page on PriceProPharmacy.com is secured and this can be checked as soon as you enter their website. The green lock is near the address bar and this indicates a secure connection. I checked what types of security they use and I found out there is 256 bit SSL encryption which is a high security level. All of their pages are highly secured and that’s really good, but the problem is that the website hides information about the owner. My rate for all I mentioned above is 4 stars. 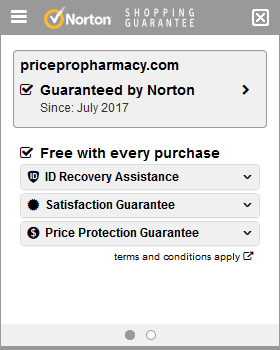 The site is antivirus secured by Norton since July 2017 which means that customers can freely purchase here. My rate for the installed antivirus is 5 stars. You should find your needed medication using the methods I mentioned earlier, select the needed drug (dosage, form etc.) and then select the quantity of the pills. Add them to your cart. You should see your shopping cart and they claim there are 5 different steps from now on. Review all the needed information and enter the coupon code if you have one then click on *checkout*. Here is the step where you need to register. After registering those steps showed above should be fulfilled. Last step that is not mentioned is to send them a copy of your prescription. Overall, the ordering procedure is pretty time and energy consuming. The only reason why I still rate them with 3 stars out of 5 is because the customers are able to order via chat or via phone except for the online method of ordering which some people might prefer. Is PriceProPharmacy.com Legit and Secure? According to the information that I have managed to find on scamadviser.com, the site is new and for this reason it has a trust rate of 81 % only. The site is claimed to be new without feedback. The site is Canada based and unfortunately, it is rarely visited meaning that it is not very popular. The website speed is average and domain age is only one year. Plus to that, organization and owner information is hidden. Scamadviser.com suggests to have big care when using the site because the site is new and often, new sites are having illegal activity. Anyway, for the review that I managed to find here my rate is 4 stars. 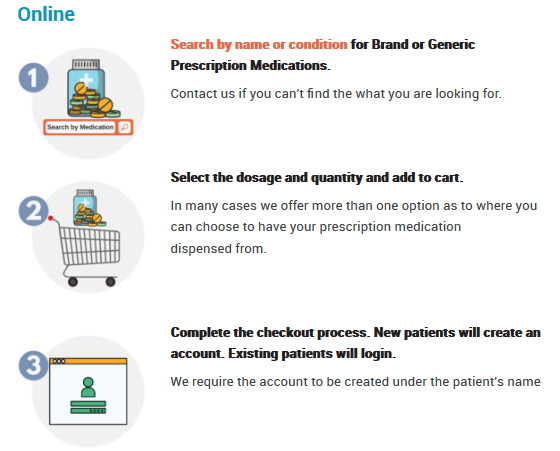 This is an online pharmacy that is requesting a prescription and without sending one, customers cannot purchase prescription drugs here. According to the information on the website, customers are having 2 different methods of sending the prescriptions: over the fax or by email scanning your prescription. Selling prescription drugs without a prescription is illegal and we are glad the pharmacy takes it seriously and offers prescription drugs with serious approach. Prescription products are having an Rx sign. For this, the pharmacy is receiving a rate of 5 stars. 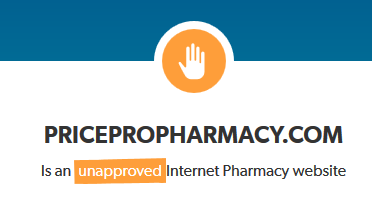 I have checked the legitimacy status of pricepropharmacy.com and I have discovered that this is an unapproved internet pharmacy website. This means the pharmacy does not meet all the criteria set by legit script to be a fully approved internet pharmacy. Although they got unapproved status, that’s not the worst status of rogue which means the site is most likely a fraud. Yet, the unapproved status is getting a rate of 3 stars. 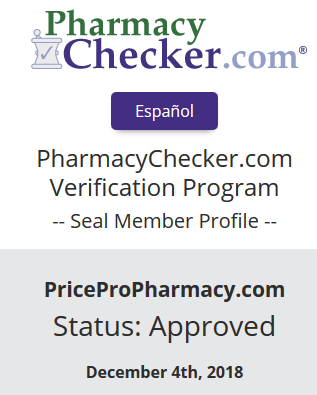 The site has been approved by pharmacychecker.com and that’s very good, but my rate is 4 stars, usually, Canadian pharmacies have other quality certificates such as CIPA, CPA or MIPA approved. 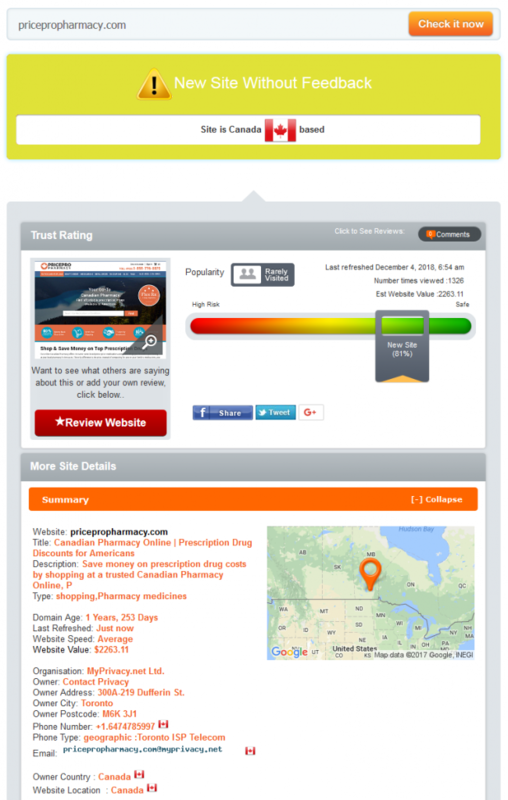 Unfortunately, the pharmacy does not seem to offer customer reviews on their own website. There are a few reviews but they claimed to be from other sources – google reviews. 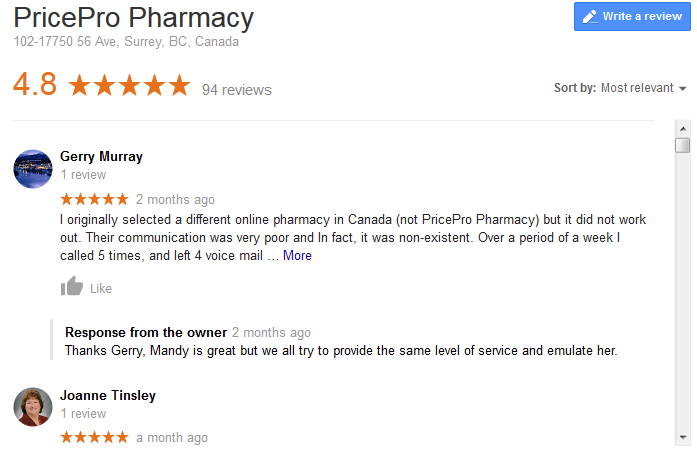 Price Pro Pharmacy suggests all customers to read the customer reviews written on google about their pharmacy since they claim to have only good and positive reviews. In the end, it is important to have customer reviews on their own website. My rating here is 2 stars since they don’t have their own reviews, but they did shared a few reviews from google and they recommend customers to go there and read. As I earlier mentioned, the pharmacy recommend to customers to find the reviews on google. I did it and they claim there are 94 different customer reviews with an overall rate of 4.8 out of 5 stars. As much as we can see, the website owner responds back as well. As much as we can see, most of the reviews are positive with only a few negative reviews. however, what’s the big problem is the fact that there are no customer reviews on different sources. I just can’t understand how the pharmacy can have 94 different customer reviews on foreign sources and absolutely all of them are written on the same source and there are none anywhere else. Because of this reason my rate is 4 stars here. By searching for coupon codes on this online pharmacy I did found out that there are 17 different coupons for 17 different medications. Each coupon is for each medication and it can save customers anywhere between 10 USD to 20 USD depending on the drug you’re choosing. Another way to save money at this online pharmacy, that I already mentioned – to purchase more quantities of pills as this is going to make you save money per pill. Except for this, there does not seem to be any other ways to save money. Overall, my rate is 3 stars only. They do offer coupon codes, but you can’t really save a lot plus, if your needed drug doesn’t have a coupon – you can’t save money. There is no free pills, other ways of discounts or free shipping offered. That’s why my rate is 3 stars. As much as I found from the *contact us* informational page, the information is all enough as it contains all the needed information. The pharmacy does offer a phone number, a fax number, their hours of operation, the contact form, 2 email addresses and 2 mail addresses, one in Canada and the other one in USA. Everything on this page is clear, it is well arranged and there is enough information. This is the reason why I am going to rate the pharmacy with a 5 stars rating. 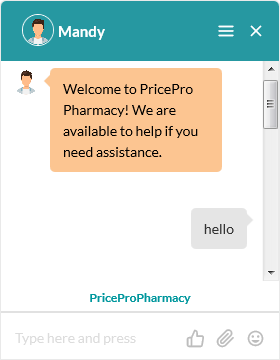 The pharmacy is also having a live chat function except for all the methods to get in touch with them that I earlier mentioned. The best news here is the fact that I got contacted through their live chat function as soon as I entered their main page and I was asked if I need some help. I did asked them a few questions and the response came back shortly. Since the contact information is enough and the responses I got are professionally answered and shortly after asking them, my rate is 5 stars here. PriceProPharmacy.com is an Canadian online pharmacy which is offering a lot of different drug categories and both generic and branded medications. Except for having a lot of different drug categories, the pharmacy accepts a lot of payment options which is a very good plus for this company. They claim to mostly ship in Canada and US but they claim that shipping can be arranged in other countries as well. The pharmacy sells medications only with a valid prescription and the prices for drugs are fairly good, however there are other pharmacies with better prices. The technical characteristics in terms of page speed for their site is pretty moderate, however the mobile version of the site is unavailable. The site does use a 256 bit SSL encryption security and Norton Antivirus, however no owner information is offered plus the registration on the site is mandatory and that’s not very convenient. The site has 81% of trust by scamadviser.com with only one year of domain age and they are unapproved on legitscript.com but they are approved by pharmacychecker.com without any other quality certificates. There are no customer reviews on their own websites and reviews only on Google Reviews. The pharmacy offers coupon codes only to some specific medications, unfortunately. The pharmacy does offer enough contact ways and the live chat function is really good with good customer support service. I’m not sure if it’s worth purchasing here.